HARRISBURG, Pa. (AP) — A Pennsylvania highway department worker won her job back Tuesday after being fired for ranting on Facebook about local school bus drivers, including a warning that she would happily crash into a school bus. HARRISBURG, Pa. (AP) — Pennsylvania drivers will be getting some relief from pockmarked roadways in the form of $180 million to fill in potholes and perform other work after the ravages of a tough winter. Democratic Gov. Tom Wolf was announcing Thursday $22 million for pothole and pavement repairs, enough to buy nearly 30,000 tons of paving material. Officials with the Pennsylvania Department of Transportation will detail bridge and highway projects planned for Somerset County in 2018 at the department’s annual transportation outreach meeting on Monday. The meeting is scheduled for 9 a.m. at the Sipesville fire hall, 968 Schoolhouse Road. HONESDALE — State transportation officials unveiled a $464 million summer road and bridge construction program Monday for six Northeast Pennsylvania counties that will affect 610 miles of roads and 83 bridges. HARRISBURG — There are 390 bridges complete and open to traffic with 50 under construction in the state’s public-private partnership for bridges, Pennsylvania Transportation Secretary Leslie S. Richards said Wednesday. As part of the statewide program, the Rapid Bridge Replacement Project, construction is expected to start on an additional 20 bridges and to be completed on eight others by the end of April. POCONO PINES, Pa. (AP) — Authorities say three highway workers were struck and injured on an eastern Pennsylvania interstate. Officials said the accident happened Tuesday afternoon in a construction zone where they were patching potholes in the westbound lanes of I-80 in Tobyhanna Township. HARRISBURG, Pa. (AP) — The Pennsylvania Department of Transportation and the Pennsylvania Turnpike Commission say they'll work with Penn State University to build a state-of-the-art highway and transportation technology center. The agencies said Tuesday that it is expected to help emergency responders, transportation planners and researchers improve traffic safety, intelligent transportation systems and automated vehicles. EAST PITTSBURGH, Pa. (AP) — A road that collapsed during a landslide in western Pennsylvania that prompted the evacuation of an apartment complex will be closed for months, state transportation officials said. Officials say the portion of Route 30 in the borough of East Pittsburgh, about 10 miles (16 kilometers) southeast of Pittsburgh, plummeted about 40 feet (12 meters) down a steep hill early Saturday. Lane restrictions on the Liberty Bridge will continue Monday through Friday, March 26-30 weather permitting. Single-lane restrictions will occur in both directions of the Liberty Bridge weekdays from 10 a.m. to 2 p.m. through Friday. Lane closures will not occur simultaneously in each direction. Luzerne County Council on Tuesday will discuss a proposal to enact a county-wide $5 vehicle registration fee to pay for repairs to county-owned roads and bridges. Counties in Pennsylvania were authorized to enact the fee effective at the start of 2015. It would be collected by the Pennsylvania Department of Transportation, which would distribute the revenue to counties twice per year, in June and December. HARRISBURG, Pa. (AP) — The Pennsylvania Department of Transportation and Pennsylvania Turnpike have lifted some restrictions imposed because of the storm. The turnpike lifted some restrictions on trucks and trailers and speed limit restrictions on sections in western Pennsylvania. MIDDLETOWN, Pa. (AP) — The Pennsylvania Turnpike has announced a ban on certain types of trucks, recreational vehicles and trailers due to the approaching storm. Officials said vehicles being banned as of 8 p.m. Tuesday are empty straight CDL-weighted trucks, double trailers, tractors hauling empty trailers, and any trailers pulled by motorcycles, passenger vehicles, pickup trucks or sport utility vehicles. Also banned as of 8 p.m. Tuesday are all motorcycles and all recreational vehicles. Motorists in Pittsburgh, Johnstown, Somerset and beyond have a common menace: potholes. Temperature swings are a big factor in pothole creation, and officials said this year is particularly bad. With the recent swings between unseasonable warmth and typical winter conditions, Pennsylvania Department of Transportation said its crews continue to address the growing number of potholes on state-maintained roads. The speed limit on interstate highways in the region has been reduced temporarily to 45 mph due to today’s winter storm, the Pennsylvania Department of Transportation announced. The reduced speed limit is in effect on Interstate 80, Interstate 81, Interstate 84 and Interstate 380, according to PennDOT. Motorists should avoid unnecessary travel today, PennDOT said in a news release. Updated information on road conditions in Pennsylvania can be found online at www.511PA.com. WILKES-BARRE — State officials on Tuesday described the scope of a project that will temporarily close a major traffic artery connecting the city with Wilkes-Barre Twp. in 2020. After five years of construction, the 11 miles of four-lane Route 219 between Somerset and Meyersdale should soon be open to public travel. Pennsylvania Department of Transportation project manager Thomas Helsel said the project is on track and should be completed by late summer. ALTOONA, Pa. (AP) — State police say a Pennsylvania Department of Transportation worker was struck and killed on an interstate. Police say 45-year-old Robert Gensimore was setting out flares in the southbound lanes of I-99 in Logan Township to warn drivers about a crash scene. Police say a car went out of control and struck Gensimore shortly after 3:30 p.m. Saturday. He was pronounced dead at the scene. The Pennsylvania Department of Transportation reports that all driver license and photo centers, including its full-service center in Harrisburg, will be closed Saturday through Monday in observance of Presidents Day. PennDOT services are available on their website, www.dmv.pa.gov. UNIONTOWN, Pa. (AP) — Two former bus drivers have shifted gears to drive and operate snowplow trucks for the Pennsylvania Department of Transportation. Krisa Walls of Georges Township was looking for a job to bring in a second income into her home when she decided to apply. The stay-at-home mom raised three children over 20 years, and her last job was driving a school bus. Webcast to address economics, safety of automated vehicles in Pa.
Two state agencies will host a webcast on Thursday about the development of self-driving cars and other highly automated vehicles in Pennsylvania. The "Connected and Automated Vehicles in Pennsylvania" webcast will run from 2-3 p.m. Thursday at this link: http://pacast.com/players/live_penndot.asp. HARRISBURG – The Pennsylvania Department of Transportation (PennDOT) reminded customers on Wednesday there are proactive steps that they can take now to help prepare for when REAL ID-compliant driver’s licenses and ID cards are available to customers who want them in spring 2019. A federally accepted form of identification must be used as identification to board a commercial flight or visit a secure federal building on and after October 1, 2020. After Jim Hudock noticed the Pennsylvania Department of Transportation was installing handicap accessible ramps in downtown Tunkhannock, he began advocating for one in front of the Dietrich Theater. Hudock is the maintenance manager for the theater and went to state Rep. Karen Boback, R-Harveys Lake, office to advocate for a ramp. Boback contacted PennDOT and within weeks the ramp was installed. About 15 reportable traffic crashes occur every hour in Pennsylvania. A disproportionate number of those crashes involve teenagers, according to Pennsylvania Department of Transportation data. To combat those statistics, the department is launching the first Innovations Challenge, open to high school freshmen, sophomores and juniors this year. CENTRAL CITY, Pa. (AP) — A psychiatric nurse has started an online petition asking the Pennsylvania Department of Transportation to add fencing to a bridge that has been used by people who jumped to their deaths. HARRISBURG, Pa. (AP) — Some lanes of a secondary interstate highway near Pennsylvania's state capital have been closed by a crash that has left crews scrambling to save a driver trapped in a vehicle. The Pennsylvania Department of Transportation says the crash happened early Monday in the southbound lanes of Interstate 283 near Harrisburg. The highways southbound lanes are shut down from Exit 2 at state Route 441 to Exits 1A and 1B, which lead to state Route 283. AIRVILLE, Pa. (AP) — Authorities say a woman died in a fall from a bridge over the Susquehanna River in Pennsylvania. Emergency dispatchers in Lancaster County said the woman apparently fell off the Norman Wood Bridge in Lower Chanceford Township at about noon Tuesday and landed onto a pylon. York County Coroner Pam Gay told the York Daily Record (http://bit.ly/2rJ0zSo ) that the woman's name wasn't being released until relatives are notified. PITTSBURGH (AP) — A Pennsylvania Department of Transportation official who's overseen billions of dollars' worth of road projects in the Pittsburgh area is leaving to take a job with a major contractor. Dan Cessna announced Friday that he's starting work Monday with Michael Baker International. PITTSBURGH (AP) — Pittsburgh public safety officials are trying to determine why a rain-activated gate failed to automatically stop traffic from entering a low-lying roadway where four people died in an August 2011 flash flood. MEDIA, Pa. (AP) — A jury says the Pennsylvania Department of Transportation should pay $5.4 million to a man who suffered severe brain injuries when his bicycle crashed on a bridge that was in disrepair. The Delaware County Daily Times (http://bit.ly/2lTeHZJ ) reports the jury ruled Wednesday in favor of 63-year-old David Carletti. 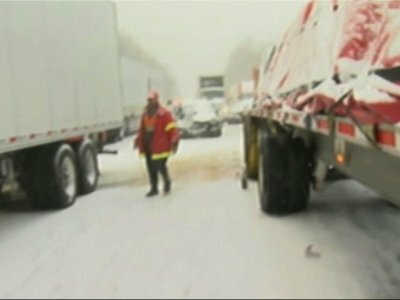 DELANO, Pa. (AP) — State transportation officials say all lanes of an eastern Pennsylvania interstate have reopened following a weather-related pileup that killed one person and injured more than two dozen other people. The Pennsylvania Department of Transportation said northbound lanes of Interstate 81 in Schuylkill County opened early Saturday and southbound lanes opened Friday evening. MERCER, Pa. (AP) — Interstate 80's westbound lanes have reopened following a crash in western Pennsylvania, a few miles from the Ohio border. CENTRALIA, Pa. (AP) — The Pennsylvania Department of Transportation is cracking down on trespassers who continue to walk on a stretch of highway that's been closed to vehicles because of an underground coal fire. LANSING, Mich. (AP) — State government, universities and researchers in Michigan, Ohio and Pennsylvania are teaming up on efforts to develop connected and automated vehicles. The Michigan Department of Transportation says Wednesday the "Smart Belt Coalition" includes the Ohio Turnpike and Infrastructure Commission and the Pennsylvania Department of Transportation as well as the American Center for Mobility in Michigan. PITTSBURGH (AP) — The federal Occupational Health and Safety Administration wants to fine a contractor $11,224 for a construction fire that wholly or partially shut down a major Pittsburgh bridge for 24 days. Contractor Joseph B. Fay Co. didn't immediately comment Wednesday. The company has 15 days to appeal. HARRISBURG, Pa. (AP) — Wintry weather in Pennsylvania prompted speed reductions on the Pennsylvania Turnpike and other roadways in the commonwealth and also caused flight and public transit delays in Philadelphia. The county's director of emergency services, Tracy Zents, says the three suffered minor to moderate injuries and were transported to hospitals. HARRISBURG, Pa. (AP) — Pennsylvania is doing away with renewal stickers for license plates in a change designed to save millions. The Pennsylvania Department of Transportation will stop issuing the stickers at the end of December , producing more than $3 million in annual savings of production and mail costs. Motorists must still have their vehicles inspected and have to produce a valid registration card when asked by police.